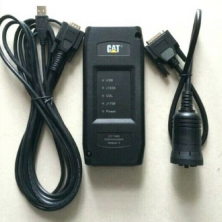 Caterpillar Communications Adapter 3 is used with the Cat ET to perform diagnostics on Caterpillar equipment. Use this adapter for transmitting data from the data connector to the Cat ET loaded PC. This tool includes the 9 pin Off-Road datalink connection. Cat On Road Equipment: Suggested, but other RP1210 compatible interfaces will work. Both 6 pin on-road & 9 pin on-road connector adapters are available at extra cost.